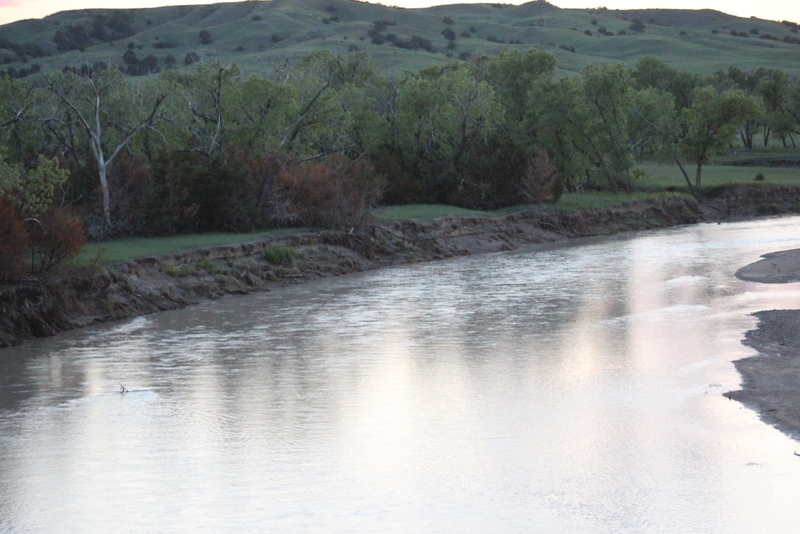 The Cheyenne River in the Cheyenne River Reservation, South Dakota is one river that is considered at risk for contamination by the Keystone XL Pipeline. 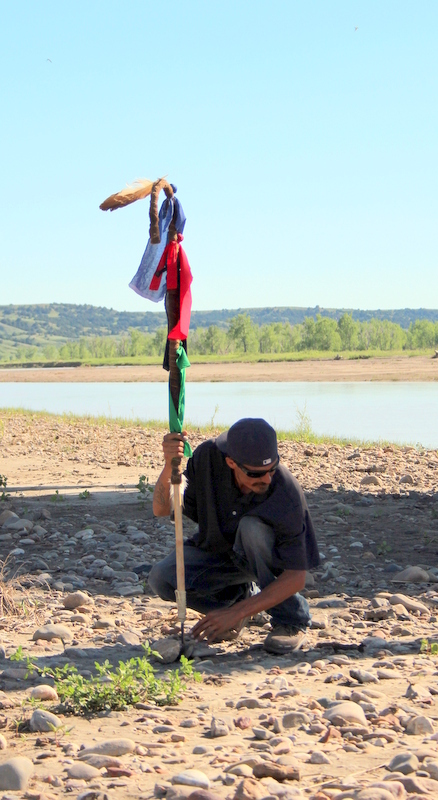 EAGLE BUTTE HOMELANDS, SOUTH DAKOTA-Today TJ Afraid of Hawk, Robin LaDue, and Wani Loud Hawk assumed a centuries-old tradition of protecting the same staff that their ancestors used to lead the Lakota Oyate into significant events. Upon the transfer their elders told them during a Hunka ceremony that they are immediately charged with protecting the Cheyenne River from the toxic chemicals that are expected to contaminate the Cheyenne from the proposed Keystone XL Pipeline if the Pipeline is built. 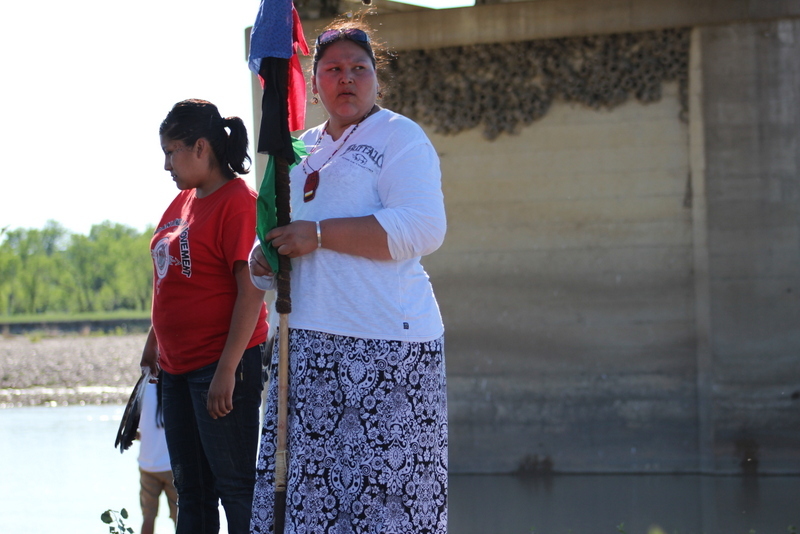 Members of the Lakota Oyate said that contamination is the most urgent and pressing danger of the current generation. Originally crafted in the 1870’s, the staff is covered with buffalo skin, a blue flag is affixed to the top and is said to represent the sky, a black flag represents direction, a red for the native people and a green flag represents Mother Earth. Elder Rocky Afraid of Hawk who passed the staff over said that it has been stored since 1973, the date which he assumed care of the staff when he was charged with tribal duties some forty years ago. 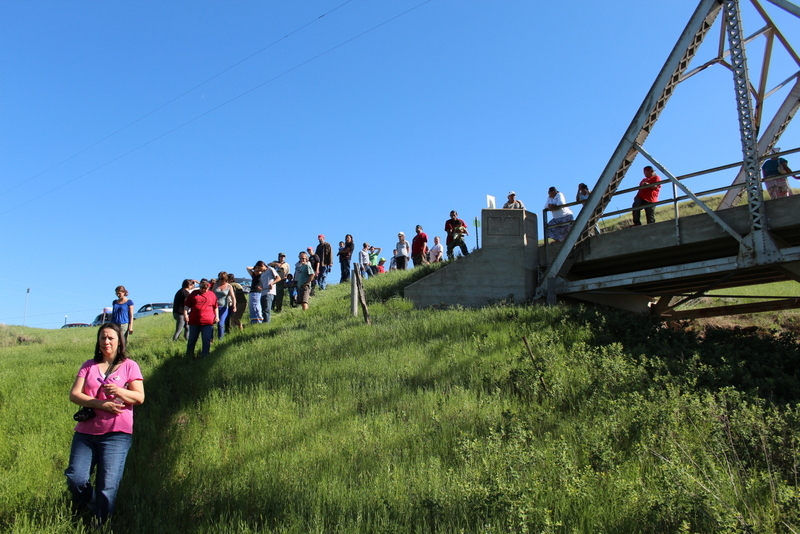 Invited guests descend to the Cheyenne River to participate in the Hunka ceremony. The one hundred thirty-year-old staff is set in the ground before the ceremony. The Cheyenne River is in the background. During a nonviolent direct-action training held before the ceremony, it was revealed what those lies have been according to organizers. At the training, hosted at the Cheyenne River Reservation in South Dakota, Rocky Afraid of Hawk said that Transcanada–the corporation that is building the Keystone XL Pipeline-has lied about the location, the contamination, and the safety issues to the environment. That statement was repeated by the more than 150 people who came to the State Department public forum on the Keystone XL in February in Grand Island, Nebraska. Sixth generation farmers along with multiple generation Indigenous Nations testified that Transcanada had lied to them about various issues related to the Pipeline including environmental damage, compensation, safety, and other issues such as claiming eminent domain status of being a common carrier. Testimony at the Grand Island event and the Cheyenne River training both criticized the government for lack of oversight of the oil industry. The nonviolent direct-action training that coincided with the Hunka ceremony was held to prepare the more than five nations who attended the event to resist Pipeline construction. 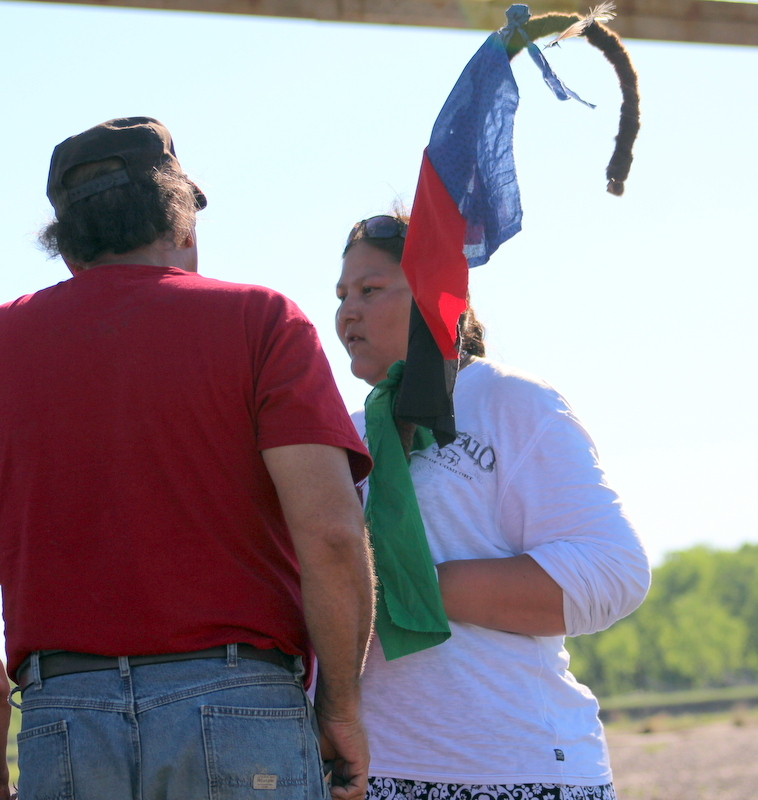 Robin LaDue accepts the staff and tribal responsibilities from Elder Rocky Afraid of Hawk. This entry was posted in Civil Rights, Climate Change/Environment, Genocide, Human Rights. Bookmark the permalink.